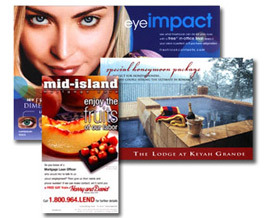 Specializing in postcard printing, promote your business in a stylish and professional yet inexpensive way. Combined with targeted mailing lists, postcards can be an invaluable asset towards your company exposure and marketing efforts. Postcards are like miniature billboards, use high quality images and powerful words to get your point across. 1. Select options for your postcards. 2. Add postcards to your list..